Maestro Giacomo Puccini gained his fame as the author of grand works of multilayered dramatic effect and musical complexity. However, as any true master, he kept in touch with the times and composed Il Trittico (The Triptych) in 1918, a modern trio of one-act operas. The Vienna Volksoper now stages Der Mantel (The Cloak) and Gianni Schicchi, The Triptych's bookends, to showcase Puccini's genius in a new genre. The inspiration for these quick operas came to Puccini thanks to the innovative works of fellow composers Stravinsky, Schoenberg, Debussy and Strauss. As an homage to them and to try his hand at a new musical challenge, he combined those eclectic influences into three condensed stage works: The Cloak, Suor Angelica and Gianni Schicchi. The Cloak is a tragic love triangle set in France. 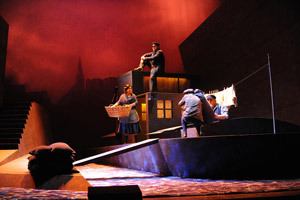 Michele owns a barge on the river Seine, and his wife Giorgetta is having an affair with Luigi, the porter. The wronged husband takes revenge by killing his rival and covering him with a cloak, which Giorgetta pulls off for a dramatic final reveal. In the short time of one act and in the confined space of a river barge, Puccini amps up the dramatic and emotional intensity with heated, visceral arias and edge-of-your-seat orchestration. The Cloak is a crime story with almost cinematic immediacy which grabs and does not let go until the end. Gianni Schicchi comes in to relieve some of the pressure with a dose of wit and playful musical numbers. It originates in Dante's Inferno and tells the story of its titular character, a confidence trickster who impersonates a recently deceased nobleman for material and personal gain. Unlike the dramatics of The Cloak, Puccini imbues Gianni Schicchi with some of his most playful and comical tunes. The mini-opera compensates its brevity with the richness of its arias and duets, which bring out different vocal qualities and moods in each character beautifully. Puccini's Triptych was first performed at the Metropolitan Opera in New York City on 14 December 1918, to excellent reviews. The Volksoper Wien now gives you the chance to experience the intensely dramatic first and the entertainingly light-hearted third part of this unique work from the Maestro's later years.